•	How are you growing in your relationship with the Lord? What is God showing you? Are you reading your Bible? •	What challenges are you facing in cultural adaptation? •	What victories are you experiencing in learning to live in Peru? •	What are some of your personal/ ministry/ work goals? •	What are your friendships/ team relationships like? •	How is your marriage? •	How can I pray for David/ Peter/ Annie/ Sarah? •	What parenting challenges are you experiencing? •	Of which sins is the Holy Spirit convicting you? •	What decisions are you considering? •	What are you most thankful for right now? From the director of Diospi Suyana Hospital, Dr. Klaus John. 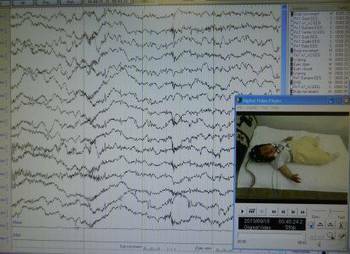 In the EEG-laboratory of the Diospi Suyana Hospital. An analysis of an infant’s brain activities. Christian Oswald, a Diospi Suyana missionary, using the computer. This question we all know and has existed since the beginning of humanity. The doctor is looking at the history from the patient. One moment later he will explain the results of the pathological exams. 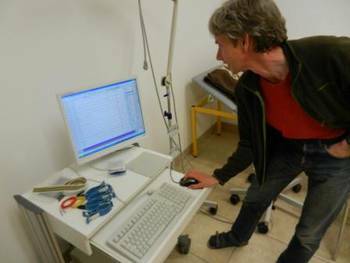 A neurologist reads the EEG results for our children. Now is the moment of truth. Will our child live or die? Will our family go through the valley of the shadow of death, where fear rules and frightening cliffs of sadness loom on the horizon? Everybody is afraid in such moments, Christians and non-Christians alike. However, there’s a big difference between Christians and non-Christians. A Christian has a hope and a perspective of life triumphing over death. On the contrary, an atheist is defenceless before his fate. He looks at himself as no more than a dust particle in the evolution process who will lose his battles with time and the universe. Sometimes, while conversing with atheists, I detect a measure of arrogance when they look at me with a compassionate smile. I ask myself, “What are they proud of? While I’m thankful for my big-city upbringing which taught me things like… er… how to enter and exit a big highway, how to find bargains by shopping at TJ Maxx, and other important life skills, now I need some of what I am calling “country living tips.” I knew this was going to happen. I kept joking with my friends about my new rural digs and all that I would have to learn. No chickens, rabbits, or guinea pigs yet, but just daily living things are a learning curve for me. Hooray for the Internet community! We are hopeful for what this family may bring with them to Curahuasi in experience and knowledge in regards to the school. We are having an interesting school experience here with our kids in a local catholic Peruvian school. The point is to learn Spanish without too many psychological consequences. I am sure Allison will write more about it in the future, but for now I will state again that we have many hopes for the Diospi Suyana school. From the Diospi Suyana Hospital website. 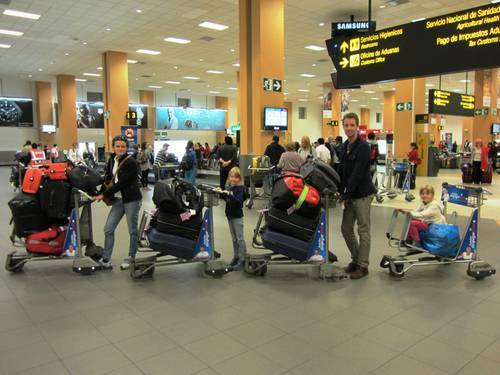 German teacher couple Bigalke arrived in Peru last Wednesday with their children. 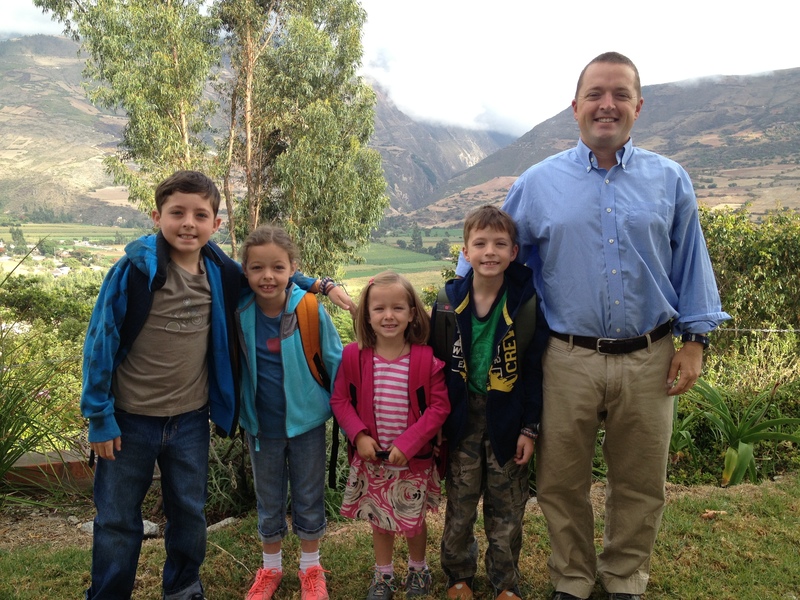 No sooner had the Bigalke family arrived at Lima Airport, they had their first picture taken on Peruvian soil. The photograph gives room to an interesting analysis. 1. There can be no doubt that the future Diospi Suyana school will be run with discipline and order. That’s what principal Christian Bigalke stands for. 2. Even after a 22 hour journey the Bigalkes show no signs of exhaustion. They appear to be extremely resilient. 3. The convoy is led by Verena Bigalke who also pushes two more bags in front of her than her husband. What does that tell us? 4. All of the important belongings of the Bigalke family fit into 14 pieces of luggage. 5. The picture of the family’s move looks somewhat static. Taking a second picture an hour later would have been helpful to prove that those 4 trolleys did actually move on. Better Internet and Computers would be great! Reading a friends blog post and I thought, why not share this on our blog. Ryan and Kirsten are new friends. Kirsten is a doctor who is showing me the way to get things done here; Ryan works in IT. We are all working at this very good hospital in the middle of rural Peru with a lot of great equipment. However our internet is terrible. And here is something you may not know about the practice of medicine in the United States. We use the internet all the time. We are better doctors because of it. We get information that we can’t remember so easily from the world wide web. And here, where I really need it more than ever, I can barely get on it at work, if I am able to get on it at all. So I am throwing out a quote from Ryan’s blog and asking as well – are there tech companies who could help us get up to the 21st century in technology? Here is an excerpt from Ryan’s blog. You can read the whole thing here. We are thankful and nothing goes to waste. Yes, I work at a volunteer hospital in Perú, I get that, but my question is: Does it have to be this way? When we work with medical companies they are excited about donating their latest-and-greatest, from UV-Water filters to CT scanners. It’s amazing and we normally get the best. Servers, computers, monitors, keyboards, mouses – we get second, third or fourth hand. Sometimes things arrive that simply don’t work, but hey, we use ‘em. Working here is taking a step back in time, it forces you to be creative. Yes, problem solving can be fun, but there is also a part of me that knows there are tech companies, startups and corporations that have resources and can donate, and not just their old used equipment. Surprise us out here in volunteer, non-profit, land. Make a statement and give us your best, both ideas and equipment. Here is a photo of all my people going to work and school, where they will have to put the Spanish they have to use. We thought everyone was going to start on Monday, but there were delays with the kids’ registration and Will had to follow other doctors for two days to learn the system, so today is the first day he is on his own. I’m sure Will is doing great, seeing patients and treating their infirmities. He said that he is going slowly, which is not his usual m.o. The kids are having to sink or swim with their Spanish today at JEBPA- Jesús el Buen Pastor Academia. I have to admit to getting a little misty as I told all the kids goodbye at their little school. I told Annie, “God is with you. Pray if you need Him!” and nearly lost it. I watched them do a short morning assembly drill and wondered how many of the instructions they could understand. I paid a little money this morning since this is a private school, and they required a copy of our passports, but I realized when I got home that they did not have me fill out a single paper. They don’t know anyone’s full names, birthdays, ages, even our telephone numbers or address. I hope they don’t need us before the school day is out! I think I’ll be an obnoxious American and give my phone number to each teacher this afternoon. Thank you, thank you everyone for your prayers and cheers for us. It is keeping us afloat. Our kids are rock stars! 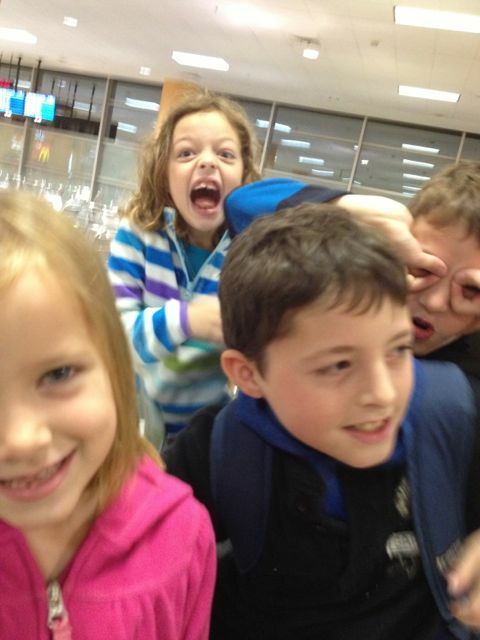 As all parents know, this is what happens to kids when you have to be at the airport at 4 AM, which means leaving your guesthouse at 3 AM, which means getting everyone up at 2:30. This was taken in Lima before we flew on to Cuzco. But the point is that everyone is right! Our kids are doing wonderful. They have skipped breakfast without complaining, climbed up the mountain many times in the dusty heat, made new Peruvian friends, eaten yet another peanut butter and pan común sandwich, taken cold and then scorching showers, tried new foods, suffered about 300 fly bites between the four of them, met dozens of new people, some of whom only speak German, and taken it all in stride. Sometimes they want to watch Disney movies on the computer or make a big mess with Legos in their room. Sometimes it is hard to share their toys or they don’t understand what their new friends are saying. Sometimes a little Coke makes it all better. Sometimes a wind storm and the resultant eating by candlelight is an exciting new experience. Sometimes watching Dad burn the paper garbage outside is so cool. Sometimes helping Mom hang the laundry on clotheslines is a good time to talk. Sometimes they need a little extra attention, but they are a super encouragement. David says that God has been reminding him of all of the ways that He is blessing us and that when he feels a little sad, he just goes outside and looks at the view and talks to God. Praise and thanks to God for fortifying our kids and for giving us such strong encouragement through our favorite ten-and-under crowd.